With the UK seeing some of the worst winter weather for a long time, the key to running a successful Enduro event is planning and experience. Wayne Braybrook planned the start of the 2018 championship back in October, to his credit, his experience shone through as he carefully choose the best all round venue for the 2018 Rock Oil championship to fire back in life. Driffield was packed out with keen riders ready to race. Despite lots of riders unable to make it due to homes still being cut off by winter weather, the almost 200 rider strong line up had a tough yet ride able course to compete on. Nicholson got his 3 laps in before the flag went out. A slight delay to the Large entry AM adult race was announced due to lots of riders signing up on the day. As the Flag Dropped Mark Cockfield was the early pace setter in the NEW Sportsman Elite class, Cockfield tiring towards the end as track conditions got more difficult, allowed Phil Dodsworth to take the win by just 3 minutes. Shaun Woffinden rounded out the Sportsman Elite podium. In the super competitive Sportsman Vets Class David Barrett took his first ever RAW win, hard charging Nigel Fox pushed the entire 2 hour race as though he had a plane to catch! Only missing the win by 40 seconds at the Flag. Foxy is getting back into shape before his European trips of the summer arrive. RAW regular Jim Franklin had an awesome result grabbing third place to start his season off in a positive way. ride trials and shook hands after a great race. Over 25 Novice riders were unable to make the start due to being cut off by snow, the 41 who did make the event were placed very close indeed. Lewis Arrowsmith started his RAW campaign well by taking the win, John Marsh was runner up and Kris Munro although tired, never gave up to grind out a solid third in class. The Second NEW class for 2018 is the Ladies. Simone Wallis never gave up, using her trials skills as she took the ladies class win. Local lass Leanne Field took runner up place, and fresh into the adult ranks Abbie Piggott did her team proud taking a well earned third place back to Derbyshire. A short break for Marshals to check the track left RAW admin staff time to get the provisional morning race results printed out. getting on with tough events. As the 2 hour race timer counted down Flack Controlled the race even taking time to pit. Thomas Widd and Brad Lilburn were locked in battle for what seemed like all race. Damo Butler had his usual steady start, then as conditions got difficult he found his rytham on his FE250 Husky. At the Flag Flack took the win, almost unaware that Brad Lilburn now back on a 125 was catching at an alarming rate, less than 20 seconds meant one more lap the result may have been different. Thomas Widd was happy with his third place, with Crowder doing the MX lads proud sticking it out in tough conditions. eventually took fifth place as Marshal had to settle for sixth. This is why these lads like racing, handshakes and a pat on the back at the flag started the post race de brief. The final new class for 2018 is the Elite Vets, Clubman and Expert combined to bolster the numbers. 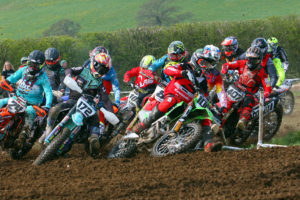 Lee Stansfield suffered with arm pump on his new 4t machine but still managed to take the win. Mark Raynor pushed him right to the flag to take runner up place just 5 seconds back, east coast Autosmart Franciseee Paul Daley Smith used his new training program to good effect to take third in very demanding conditions. earth to get to this event with less than perfect traveling conditions, a long winter break had riders ready to race, RAW didn’t let them down, the planning and careful venue choice means this club are now up and running for the 2018 season. Round 2 takes place in two weeks time at another “safe” venue with Hard Standing parking at Ripon in North Yorkshire. Once again already ahead of the game, Wayne Braybrook has negotiated some more new ground to keep the regulars on their toes whilst providing the masses with the best events in the North of England. Well done to all riders who participated, this long winter will break soon then RAW will introduce their Brand New Venues into the summer season. Gratitude as always to everyone who plays a part in the success of RAW Enduro as the club establishes itself as the Largest in the North Of England. Jake Nicholls Prepped and ready for Maxxis!